Even though Ben Braver saved Kepler Academy from total destruction last year, he knows he still doesn’t fit in at his secret school for kids with special abilities. Ben’s been hiding his lack of super skills, but it’s getting harder as his classmates’ powers are getting stronger. 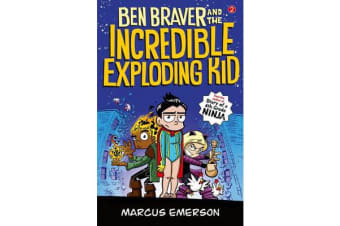 The Super Life of Ben Braver: The Incredible Exploding Kid is jam-packed with illustrations and comic strips. It’s another wacky adventure from Marcus Emerson, the author behind the hit Diary of a 6th Grade Ninja series!